It occurred to me recently that I have never stated prices or budgets for restaurants that I’ve written about. This is not an intentional disservice to the reader, I simply think it is a little tawdry to overcast the splendidness of a meal with a quotation. Much like when I go to meals en masse and on receipt of the bill, pennies become pilfered when appetites have in fact been equal. The liberation that comes with eating out is possibly my downfall though as I have no inhibition with regard to food and tend to throw myself voraciously into the simple act of EATING, not considering the digits increasing speedily on the servers till. Alas, I fear this would detract from the utter pleasure I gain from consuming new and exciting dishes, as well as swilling unchartered offerings from a well-considered bar menu. And in the fine company of good people too, there is a something so gratifying about this social act (although I have had many a divine meal solo. I encourage you try it). 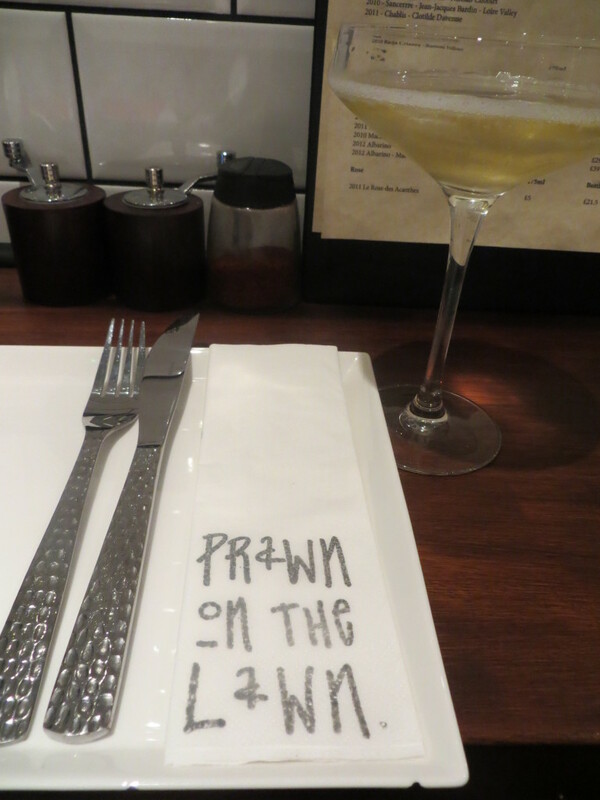 And so I bring myself to rave about the newly opened Prawn on the Lawn; a much anticipated fishmonger & restaurant that opened its doors last month to the locals of Highbury & Islington. In a City rife with meat (one is not complaining), it had been a while since I had heard of specialists in Fruits of the Sea within near vicinity and I was most eager to indulge in their produce. A perk which no doubt cushioned my entry was an unexpected discount through a social media competition so this meant I could eat twice as much at half the price. Superb. So Emilia and I proceeded like sharks in open water, encircling the immediate fresh counter of fish and crustaceans laid seductively under spotlights upon glistening ice beds. As a passer-by, you may assume an intimate private party is occurring, with the minimalist wall-facing seating and engaging staff, headed by owner Rick Toogood who welcomes you chirpily into his fish-fold. 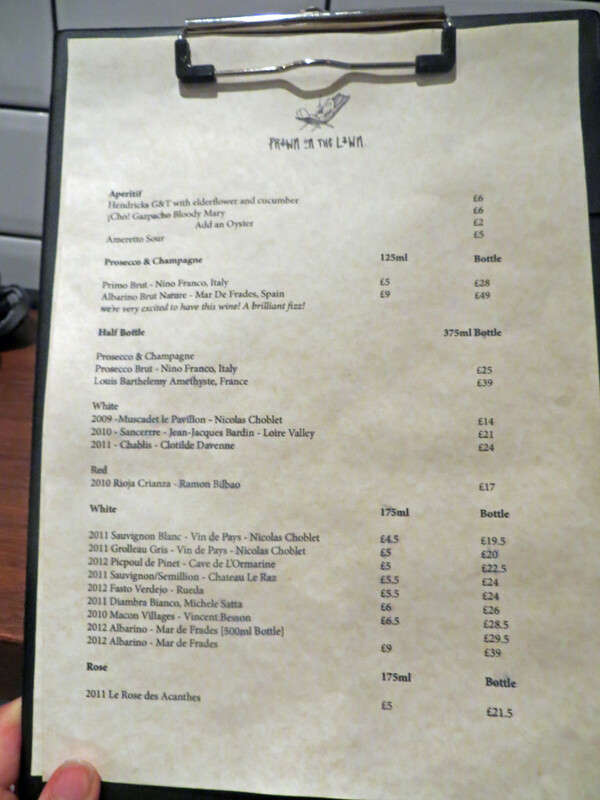 But shed your hesitation at the door and step inside as a well-sourced wine list also greets you. We began with a glass of sparkling Albarino to whet the appetite whilst I gazed avidly around the tiled walls and preparation area. 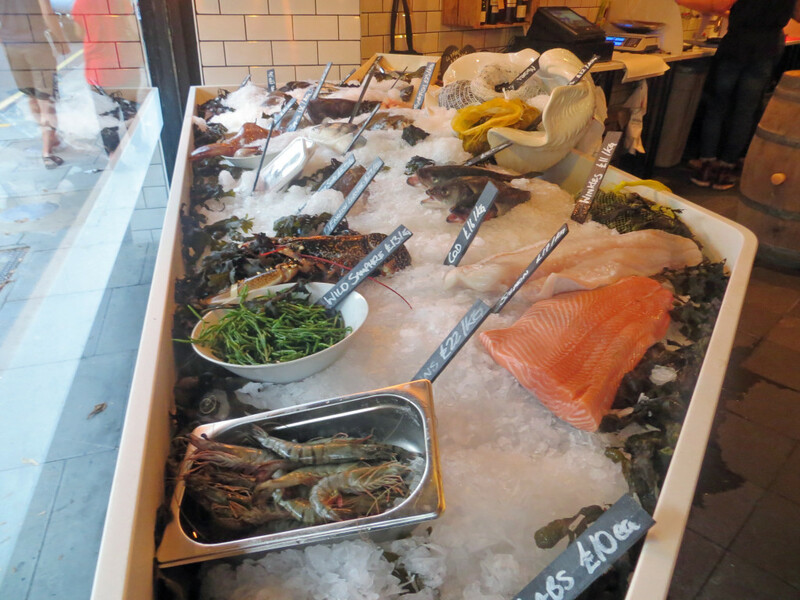 Fresh fish does indeed not annoy the nasal passage and I was drawn to many slippery offerings at the counter, with dinner menu scribed in chalk on the focal point black boards (and they do change dishes so complacency is not an option). I was later informed by Rick’s other key team member, girlfriend Katie, of something applause worthy, setting themselves aside from many fishmongers by sourcing the fish not from Billingsgate but direct from the English coastal suppliers in Brixham. 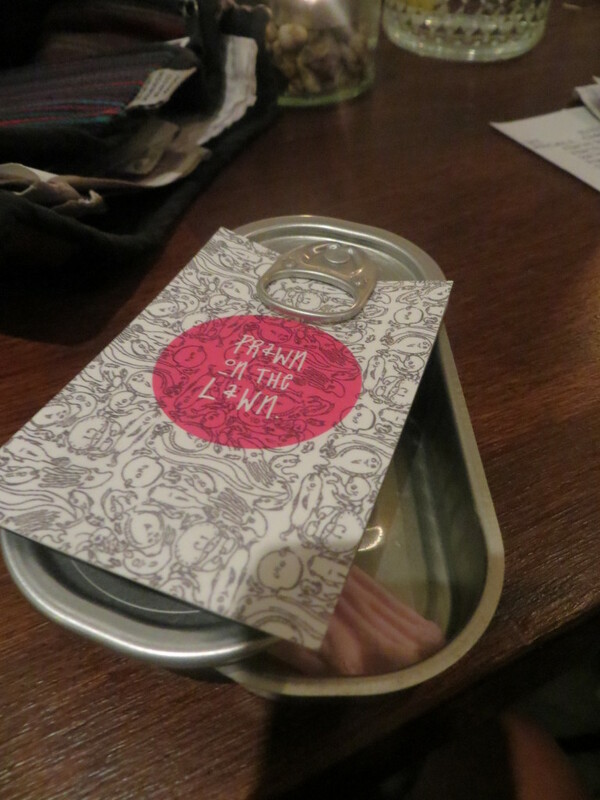 A journey of no longer than 30 hours from sea to plate is something not to be scoffed at. So the feasting began…. 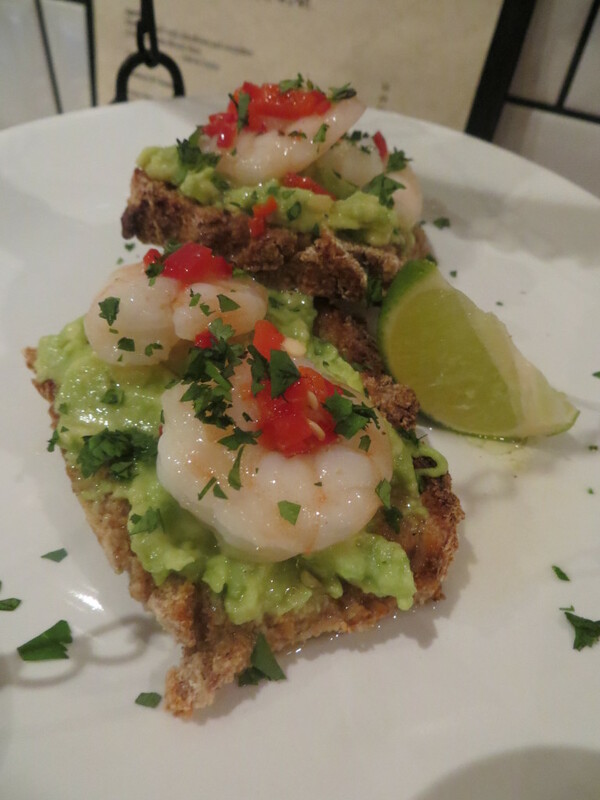 Starters were ordered in the form of Scallop Ceviche with chilli, coriander, passionfruit & Hendricks Gin, then signature dish Prawn on the Lawn (2 chubby prawns nestled on a thick sweep of guacamole over a toasted slice of home-made soda bread) and the Citrus cured Bass with beetroot & cucumber. The ceviche was sliced lovingly and gone within a couple of gulps (not difficult really as the fusion of herbs and fruity elixir marinade paired well). Equally the signature bruschetta style dish POTL was well seasoned and plump prawns were mowed down speedily. 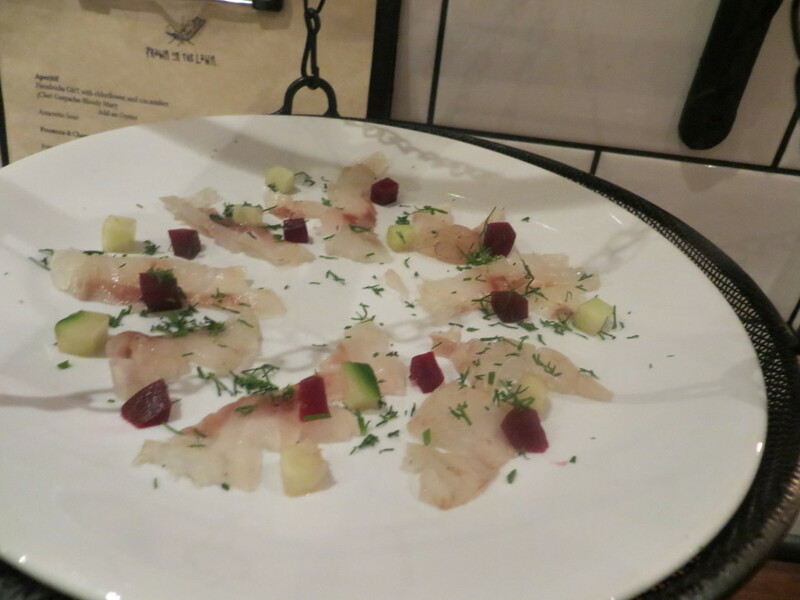 The citrus cured bass too was a delight, providing a delicious bite to the tooth from the curing process. All too swiftly did we consume, then following with another glass of white in the form of an excellent 2012 Picpoul de Pinet, crisp choices that did not overpower any of the masterful delicate fish we were enjoying. Next up I toyed with the idea of an amuse bouche in the form of an oyster, a crustacean I rarely engage in due to disappointments in the past. They had 2 choices here though; Lindisfarne and Jersey so from jovial encouragement by the waiter, I opted for one of each. 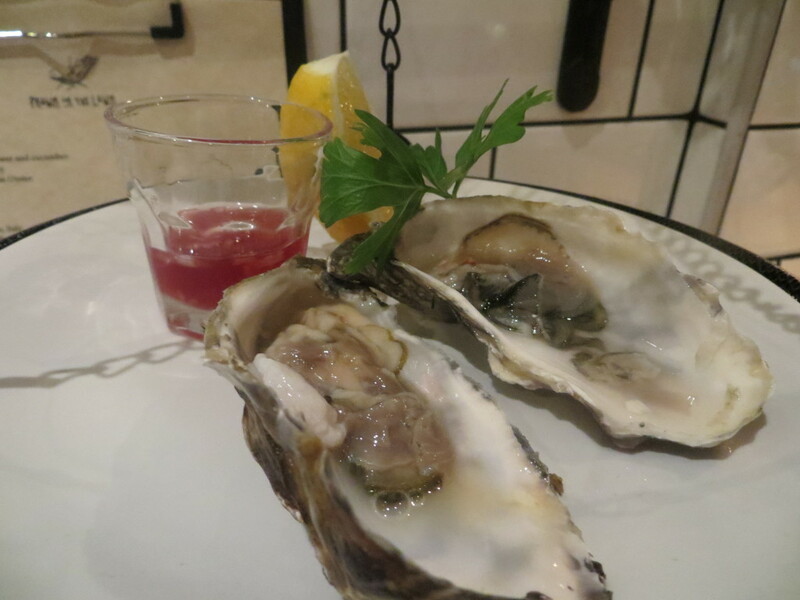 The shallot vinegar sprinkled over with a quick squeeze of fresh lemon only complimented the 2 mouthfuls that are perhaps my most pleasing oyster experiences to date. No graininess or unwelcome consistency, they slipped down with much satisfaction, although not too much dissimilar in taste to a novice as myself, the Jersey did have a silkier movement which I favoured. To follow on from this plethora of curious dishes (which all get hung in front of you from metal holders that you can sweep aside as and when finished. 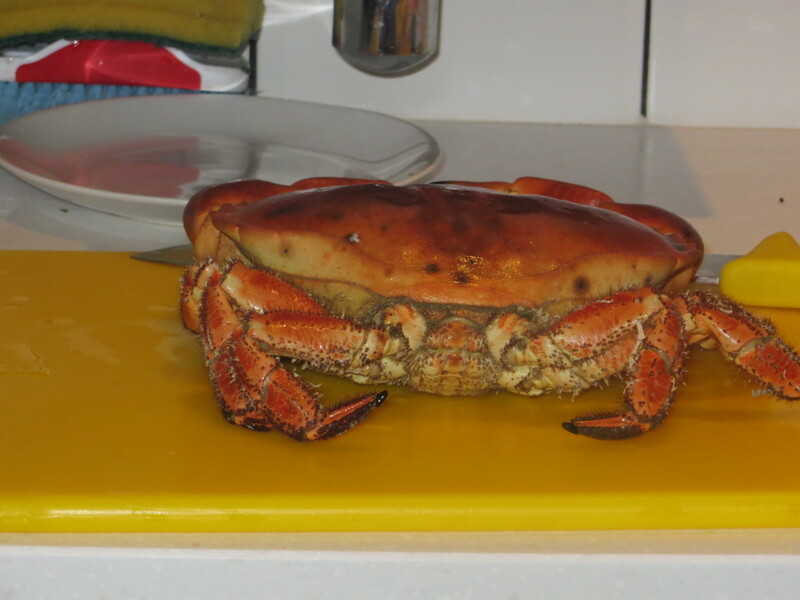 I do recommend taking the plate out though for smaller dishes to avoid unfortunate casualties from plate to mouth), I rolled my sleeves up to work a little for my main course, in the form of a whole Brixham Crab. The freshly cooked and cooled creature faced me from the opposite side of the room; however it arrived broken into 6 key pieces arranged beautifully on a bed of ice with lemon, horseradish and shallot vinegar in tow. With operating implements provided, I proceeded to break its claws and legs slowly to draw out the tender, utterly fresh meat within. In so many places, humans avoid the act of seeing their food in its original form however it is a reality that what you eat did once live so I only see it respectful to hold good ceremony over its final resting place than continue in ignorance. 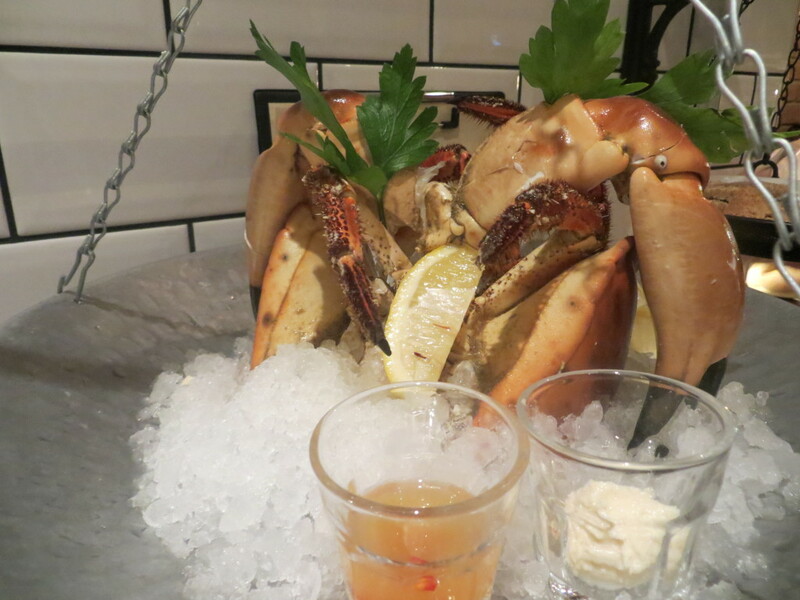 Be warned though, eating a crab is not a delicate affair; one must plunge in with vigour and get messy. 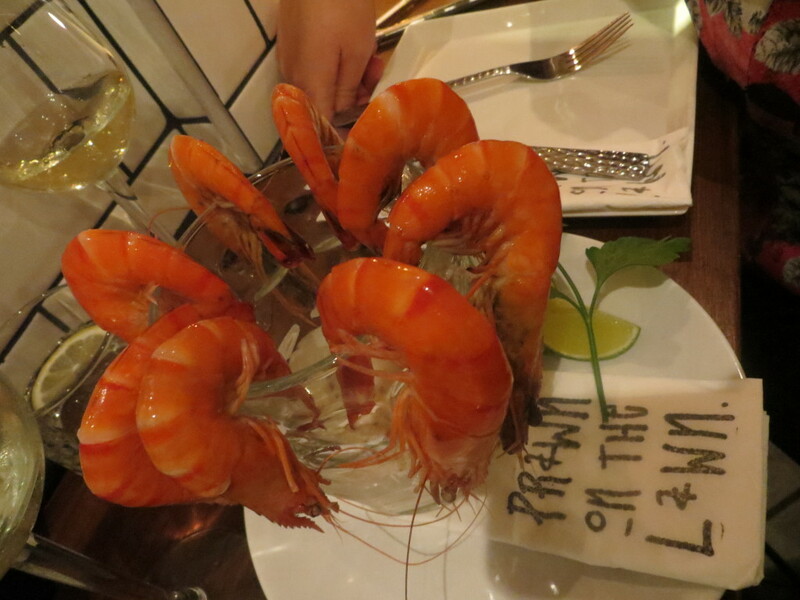 Which I did, slowly but surely, interrupted only by enjoying some of Emilia’s pint of Prawns with lime crème fraiche. Aside from the Philippines, I rarely enjoyed crab elsewhere so this was a rewarding treat. 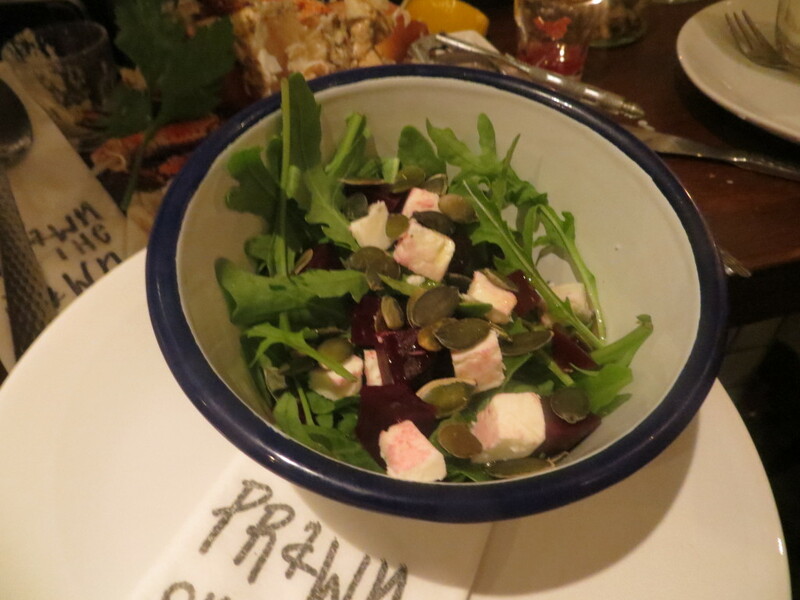 The two delicious side salads were also ordered to compliment the protein fix we were enjoying; Heritage tomatoes with olive oil and basil and the Beetroot, Feta and pumpkin seeds. A third glass of white, this time the 2011 Diambra Bianco, crowned the evening and polished off the fond memories of the fish we had enjoyed. 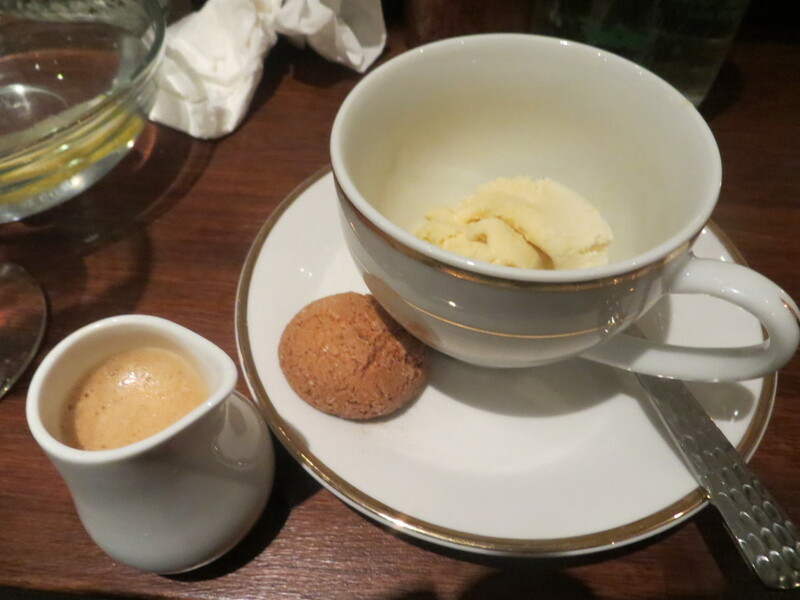 Insatiable in appetite I am, so both of us opted for the sweet treat of Affogato (scoop of vanilla with a shot of espresso on the side to pour over, with a crisp bite of an Amaretto biscuit to add to the textures) to conclude before the bill arrived in a darling mock sardine tin, containing 2 retro pink shrimp sweets. I will stay true to my word though and not disclose the final price, there is a menu after all and calculations can be made if you please. 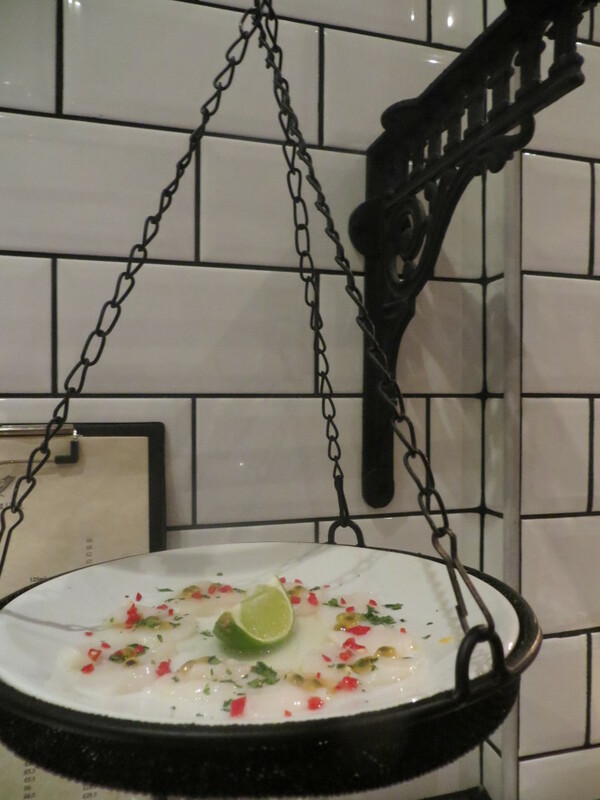 Just don’t spoil the fun; quality food deserves to be treated as just that, in an almost priceless way. So merrily we eventually departed the fair abode of Prawn on the Lawn, which I hope many will appreciate for its other additional features in the form of wonderful service, loving attention to detail and unending desire to accommodate clientele with whatever the heart desires. Perhaps it’s the effects of those aphrodisiacal oysters talking but I am enamoured with fish once again.